I have been playing with the demo version of this forthcoming multi-media CD “Unveiled Secrets No.1 MiG-29” which promises to be an unsurpassed reference source for the MiG-29. 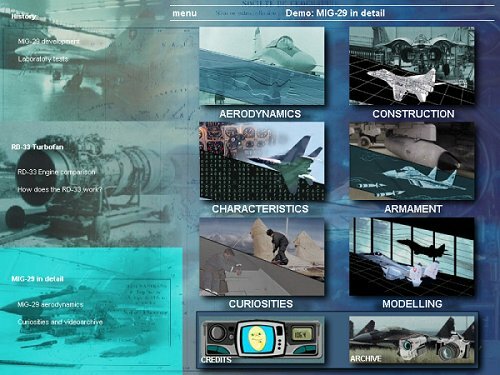 The final CD will contain a total of 2,200 hi-res detail photographs, more than 70 videos and numerous Shockwave animations covering every aspect of the MiG-29. Individual sections cover the history of MiG and the development of the MiG-29 with numerous photographs as well an in depth coverage of the RD-33 Turbofan again with many excellent photographs and Shockwave animations of the internals and engine operating profiles. 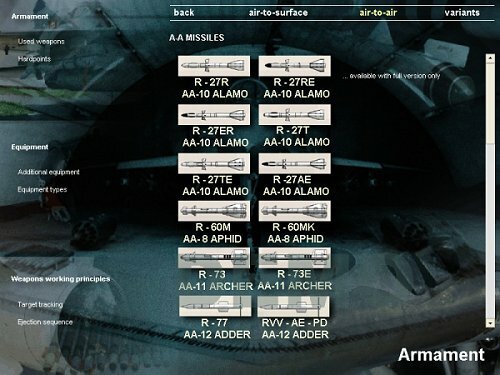 All users of the MiG-29 are listed with detailed information on the number and type of aircraft used by each air force. The MiG-29 is then covered in detail with sub-sections on its Aerodynamics, Construction, Characteristics and Armament. 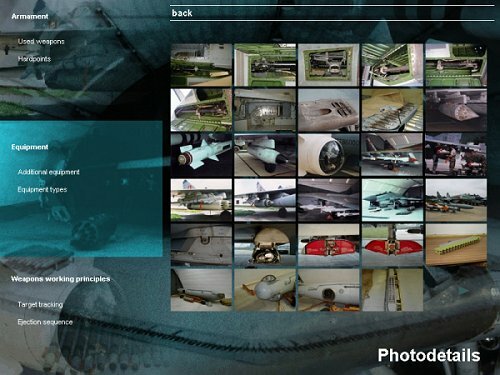 Each has many excellent photographs and video sequences as well as detailed information of individual components, for example the section on weapons has detailed information on all ordnance carried for air-to-air and air-to-ground weapons as well as the internal cannon. Each item is listed with more detailed info available by clicking on the image as well as some shockwave animations showing typical delivery profiles. If the amount of detailed information and photographs provided is not enough there is also a large section on modelling the MiG-29. 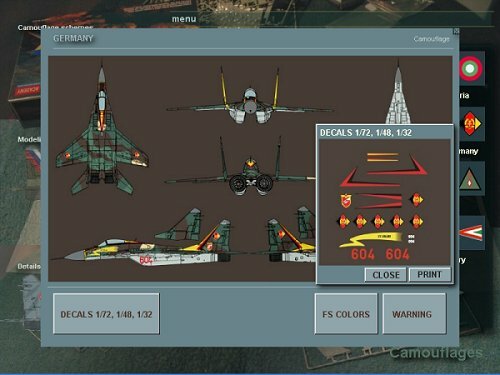 This includes camouflage schemes for all the different users which can be printed out in the three popular scales of 1/72, 1/48 and 1/32 as well as one set of decal templates for the aircraft shown which again can be printed in each of the three scales to make your own markings for any Mig-29, access to a good quality colour printer would be an advantage here. The colour decal templates are provided as Acrobat files to ensure the dimensions remain accurate no matter what your system and printer setup. There are also detailed blueprint drawings of sections of the aircraft with dimensions in the three scales to allow you to either correct minor errors in the kits or convert them to some of the variations of the real aircraft. 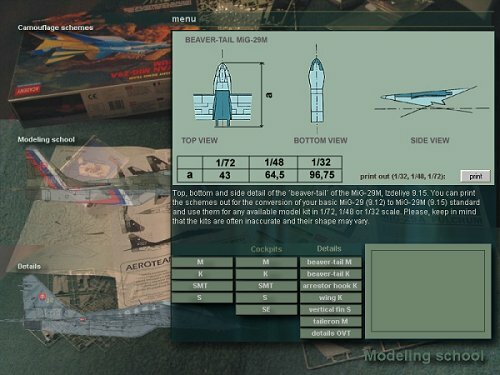 These again can be printed out to use as templates when building the model, for example the spine profile is shown in its original form and for the later MiG-29M as well as different shaped beaver tail on the MiG-29M. A detailed section on painting is provided to go along with the schemes which includes information on the FS paint numbers and equivalent colours in the Tamiya, Humbrol, Testors and Gunze Sangyo paint ranges, this is complimented with comments on each MiG-29 kit available as well as some detail sets available to spruce up your kits. In all this looks like it will be a superb and invaluable information source on the MiG-29 from a historian and modelling viewpoint. A more detailed review along with systems requirements and CD navigation info (which is quite simple to follow) will be available closer to the proposed release date of October this year The expected price will be USD$50 and given the amount of information on the CD this seems quite reasonable. For more information on the CD and preview shots of its contents you can visit the Unveiled Secrets web site.